“Let’s finish this conversation downtown.” I put his hand on Bill the shoemaker's shoulder as we start walking. No need to be nasty about it, I figure. This man has just saved me a ton of time and paperwork by confessing to the murder of Princess Isabelle. Plus I don't have to spend any longer than necessary out here at the Renaissance Faire. “I wish I could renounce my elf magic,” Bill says suddenly. I see Jessie Morton smile. She knew all along what the shoemaker was going to confess to. As usual the joke is on me. “Could I have a word with you, Bailiff?” I call Chase outside the ever-growing group of residents in crazy costumes. “Because you don’t really have any magic either,” Jessie reminds him. I'd quit my job if I wasn't so close to retirement. This whole journey back into time thing is driving me crazy! And now all of them think they have magic too. They don't pay me enough money to deal with this stuff. And that's why I hate the Renaissance Fair. Huzzah, and all that crap. HUZZAH! 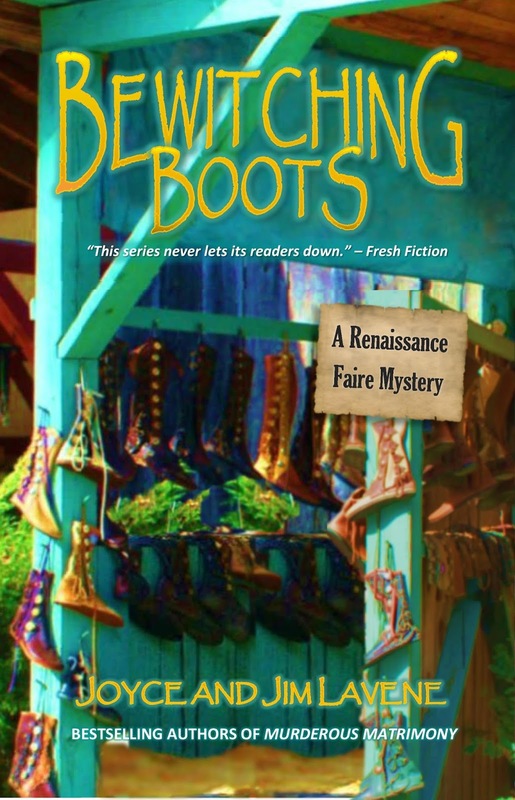 WIN A PRINT COPY OF BEWITCHING BOOTS BY LEAVING YOUR COMMENT HERE. CONTEST ENDS AT MIDNIGHT ON AUGUST 13th. This sounds like a great book and I look foward to reading it. Thanks for stopping by, Becky! Huzzah! Becky Prazak - You are our winner! Sounds great! Excited to read it. would like to go again!!! I've never had a bad time at a Ren faire or festival, Cyn! Huzzah! I've got to read this book to learn more about this "elf" magic. Hi Sue! We were thinking about the Keebler elves when we wrote it. And someone had to make Cinderella's magic glass shoes, right? It's time to start reading this series! Thanks for stopping by, skkorman! Thanks GMCT! We love Missing Pieces too! New one this fall - A Ghost Horse Christmas. It'd be hard being a policeman at a faire. Detective Almond gets that, Sandy. Thanks for stopping by. I love the Lavene's books! Would love to try this series! Huzzah Barbara. You are right! Do you think Bill could make me some shoes for house cleaning and fill them with his elf magic? I had really rather read than do housework! What a good idea! I'll see what I can do, Donna! Huzzah, indeed! I'd like to find out what actually went on. Huzzah, Libby! Thanks for stopping. I like the cover on this book. Thanks, Charlotte! We have a great cover artist! I love it, that is too funny, lol. Every year I say that I'm going to make it to the Renaissance Fair and every year I seem to miss it. Some day I will get there, really I will. Try it, Debbie. You'll be hooked! Love your books and the covers. I cant wait to read this one!!! Sounds like another series I need to look into. ..."medieval murder and mayhem" - you can't beat that! I've only been to the Maryland one, but I loved it! I'm looking forward to trying the one here in Tampa next year. It's a lot of fun, Ana! I actually think I would love to go to a Renaissance Fair. I can see why he hates the faire. Looks good. Everyone likes different things, Virginia! I would love to go to a Renaissance Fair. My friend use to work at fair and loved sharing her stories of all the fun she had. Our first views of a Ren Faire were behind the scenes. It's crazier there than on the cobblestones. I have not read this series, but i want to!!!!!! I loove the renaissance festival, i go every year. And I love a great mystery, so this is perfect!!! Thanks for the contest!!!! Thanks for stopping by, Destina! That was hilarious, especially the irony of the "Huzzah, and all that crap. "; ahahaha... still laughing! I love characters that are crotchety or have a moment of grumpybuttness. Yeah. He liked it, lavendersbluegreen. Love the Ren Faire mysteries. I took my nephew to the King Richard's Faire in Carver, MA when he was little. He had a blast shooting arrows, watching a blacksmith make a sword, riding a camel, and watching the joust at the end. His little friends thought I was the coolest auntie. They are a lot of fun, Mary!